The lemon (Citrus × limon) is a smaa evergreen tree native tae Asie, an the tree's ellipsoidal yellae fruit. The fruit is uised for culinary an non-culinary purposes throughoot the warld, primarily for its juice, though the pulp an rind (zest) are an aa uised in cuikin an bakin. The juice o the lemon is aboot 5% tae 6% citric acid, which gives lemons a sour taste. 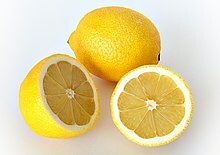 The distinctive sour taste o lemon juice maks it a key ingredient in drinks an fuids such as lemonade.